Unfortunately time constraints (i.e my day job) keep getting in the way of me updating this site so all Ive been able to do so far for Evertons Goodison Park football ground is a very basic bit of background. 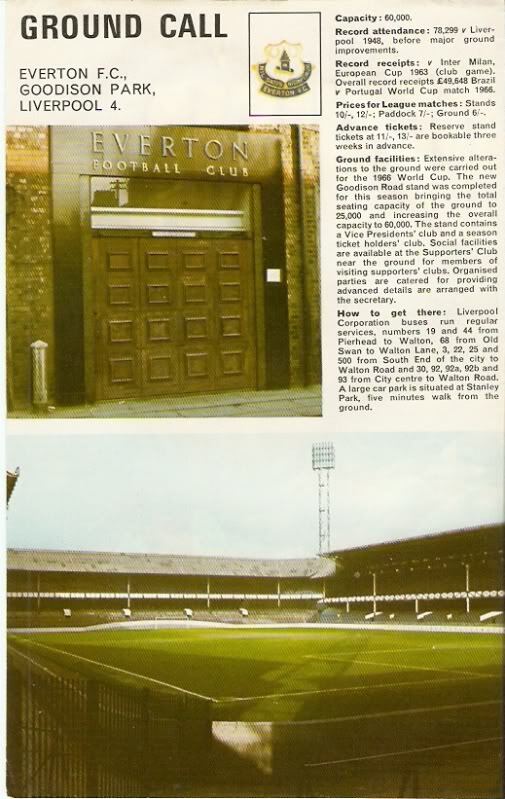 The picture below is taken from a 1970's Football Review magazine and it shows "Goodison Park" as it used to be. "Everton FC, Goodison Park, Liverpool 4. Capacity : 60,000. Record attendance : 78,229 v Liverpool 1948,before major ground improvements. Record receipts : v Inter Milan European Cup 1963 (club game) Overall record receipts £49,648 Brazil v Portugal World Cup match 1966. Prices for League matches : Stands 10/-, 12/-; Paddock 7/-; Ground 6/-. Advanced tickets : Reserve stand tickets at 11/-, 13/- are bookable three weeks in advance. Ground facilities : Extensive alterations to the ground were carried out for the 1966 World Cup. The new Goodison Road stand was completed for this season bringing the total seating capacity of the ground to 25,000 and increasing the overall attendance to 60,000. The stand contains a Vice Presidents club and a season ticket holders club. Social facilities are available at the Supporters Club near the ground for members of visiting supporters clubs. Organised parties are catered for providing advanced details are arranged with the secretary. How to get there : Liverpool Corporation buses run regular services, numbers 19 and 44 from Pierhead to Walton,68 fromOld Swan to Walton Lane. 3, 22,25 and 500 from South End of the city to Walton Road and 30, 92,92a, 92band 93 fromCity Centre to Walton Road. A large car park is situated at Stanley Park, five minutes walk from the ground." I will be coming back to this page to expand a bit on the history of this old football ground so if you have any old stories, photos or interesting facts about it please get in touch. In the meantime I have found an excellent video of Goodison Park as it was in the 1970's, to watch simply play the video below.